If Dr. Griffith’s years of experience have taught him anything, it’s that in order to provide the highest quality care possible, you need to have the right instruments. This is why he invests in some of the latest dental technology available and attends numerous continuing education courses to stay on top of the newest advancements. Thanks to this approach, if there is technology or special equipment that will improve your experience with us, you can trust that we probably have it! Read on below to learn more about some of the modern amenities here at Brookside Dental Care. This handy little device helps turn regular appointments into a fun and interactive experience. 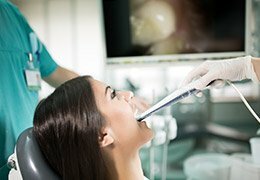 A small, pen-shaped camera fits easily into the mouth and can capture high-resolution images of the teeth and gums we can instantly display on a nearby monitor. These will make it much easier for you to understand what Dr. Griffith and our team are talking about when it comes to your dental health, plus they can help us spot minor issues even sooner. With our cone beam CT scanner, we’re able to create a fully 3D X-ray image of a patient’s teeth, jaw, and surrounding oral structures. This type of image is not only extremely cool to look at, it also gives us a more complete understanding of a patient’s dental anatomy. With it, we can quickly find hidden infections and more accurately plan procedures like root canals or dental implant placement. 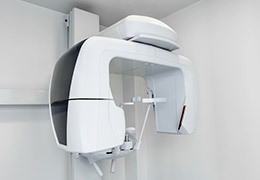 With some procedures we can use the benefit of our digital impression system. 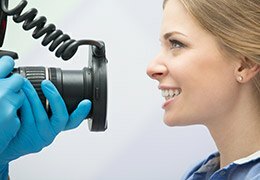 This device uses a small scanner to take dozens of close-up images of the teeth and gums that software then “stitches” together to create a digital 3D model of the bite. It only takes a few minutes and is less messy and quicker than traditional impressions.